HeiTech Secure-Xchange & CSM-ACE 2018 – HeiTech Managed Services Sdn.Bhd. HeiTech Padu Berhad, via HeiTech Managed Services Group, had just went on its biggest endeavour yet in recent years. Dubbed ‘HeiTech Secure-Xchange: Securing ICT in the Digitalized World’, the event was held in conjunction with CyberSecurity Awards, Conference, and Exhibition (CSM-ACE 2018). 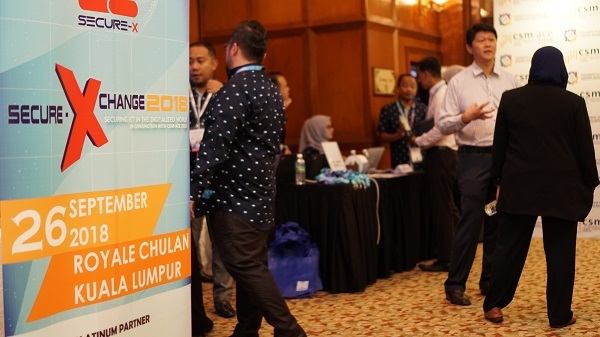 Held on the 26th of September 2018 at the Royale Chulan Hotel Kuala Lumpur, the full-day conference was attended by more than 80 delegates from both the public and private sectors. Supported by Cisco, Trend Micro, Sangfor Technologies, Exclusive Networks, Forcepoint, and Fortinet, the event provided an opportunity for HeiTech to highlight its managed cybersecurity services within the cybersecurity industry. The conference’s agenda was packed with eight exciting presentations from local and international industry experts. Mark du Plessiss, ASEAN Security Senior Principal at Accenture, provided an engaging keynote address entitled ‘The Future of Cyber Security is Physical’. Next was Tengku Shahrizam Tengku Abdullah Sulaiman, Security Specialist as Cisco Systems Malaysia, with his presentation entitled ‘Integrate, Automate, Overcome – Creating an Effective Cyber Security Approach’. Right after a quick tea break was Khuzairi Yahaya, Deputy CEO (Registration & Business Services) at SSM, with his talk: Integrated Security Infrastructure within SSM Digital Transformation. Afterwards was Khairol Amin Mohd Salleh, Technical Advisor at HeiTech i-Solutions, giving his presentation dubbed ‘The Myth of Software Security’, which then gave way to lunch break. The second-half of the full-day event started with a security breach demonstration by Syahril Aziz, Managing Consultant at MyCrypto Sdn. Bhd. Next was Sage Khor, Senior Presales Consultant at Trend Micro Malaysia with his slot titled ‘Securing Your Connected World’. Moving the agenda forward was Ahmad Rizan Ibrahim, President and CEO of MIMOS Berhad, with his presentation: Social Media Era – Security Threat from User’s Perspective. After another tea break, the baton was then passed to Keith Lee, Product Manager at Sangfor Technologies, with his talk entitled ‘Guarantee Critical Business with Intelligent DC’. And last but not least, Juliana Johari, Business Director – Managed Security Services at HMS, closes the day’s presentations with her slot titled ‘Digital Transformation: Changing the Security Approach for Enterprise’. Staying true to its direction of heading towards Dx, HeiTech Secure-Xchange was powered by its very own mobile app. The Secure-Xchange mobile app encompasses every aspect of the conference; from attendee registration, presenters’ profiles, Kahoot-style pop quizzes and event photos, the mobile app was the one-stop shop for the event’s contents. As the Strategic Partner of CSM-ACE 2018, HeiTech Padu Berhad was also participating as an exhibitor for a total of three days. Starting from the 25th to the 27th of September, the HeiTech Padu Berhad booth showcased an array of offerings, namely Secure-X (Managed Securiy Services), PaduNet’s Branch-in-a-Bag, and i-Sentrix’s HMS Smart Data Centre. The booth also received a visit from YB Tuan Eddin Syazlee Shith, Malaysian Deputy Minister of Communications and Multimedia. 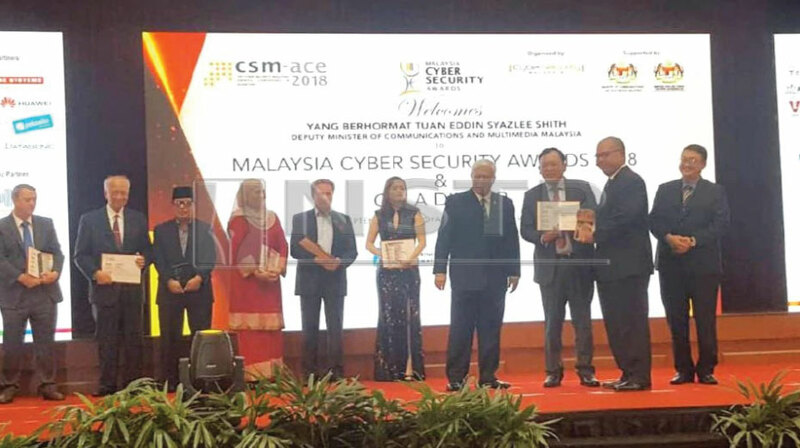 HeiTech Padu Berhad has also managed to bag the award for Cyber Security Innovation of the Year at the Malaysia Cyber Security Awards for its innovative technology and new security service, Secure-X. Secure-X would help industries revolutionize their operations and reap a multitude of benefits in digital transformation leading to increased cybersecurity and business performance. Secure-X was installed on SSM’s Transformation Programme Integrated Security Infrastructure Services Project.